1. Executive Sponsorship – Customer service has to be as important as finance, sales, operations, and technology. It needs to be talked about at board meetings and strategic planning sessions, with leaders and everyone else in the company, including frontline employees. The senior leadership team has to provide the necessary resources to create long-lasting change. People must be able to tell that the leadership of the company is truly committed and passionate about the Customer experience. The best Customer service companies in the world have leaders who are obsessed over their company’s Customer experience, down to the smallest detail. They passionately articulated their vision for world-class experience every time they spoke, to anyone and everyone who would listen. And their companies are all known for world-class Customer service. Service Aptitude starts at the very top. 2. 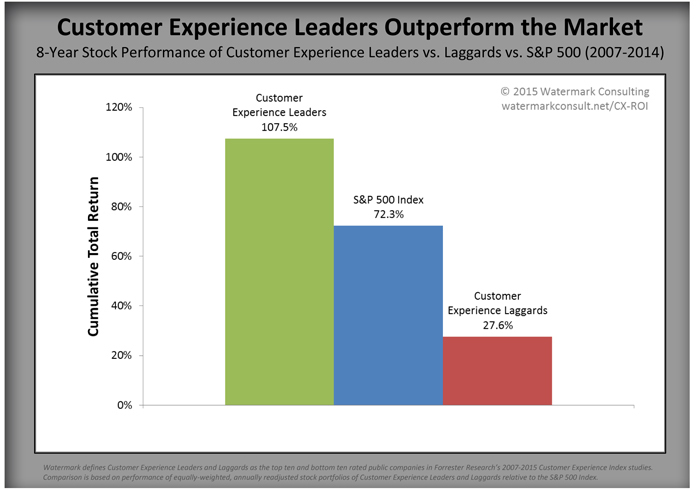 Return on Xperience – Watermark Consulting released its annual Customer Experience ROI Study. They studied stock performance of the Top 10 and Bottom 10 publicly traded companies in Forrester Research’s annual Customer Experience Index rankings. Probably not surprising is that the top 10 CX companies did better than the bottom 10. What might be an eye opener is by how much better the top 10 outperformed not only the bottom 10, but also S&P 500. * The CX top 10 outperformed the S&P 500 by 35%. * The CX bottom 10 underperformed the S&P by 45%. * The CX top 10 outperformed the bottom 10 by 80%.